Until a short while ago, I had never seen Die Hard. Yes, I know: shocking. I'm a film person, yet I haven't seen what is widely considered to be the best action film of all time, & also the best Christmas film of all time. Well, I'm happy to report that both of those things about Die Hard are true. Based on the 1979 novel Nothing Lasts Forever by Roderick Thorp, the film follows John McClane (played by Bruce Willis), a detective with the New York Police Department. 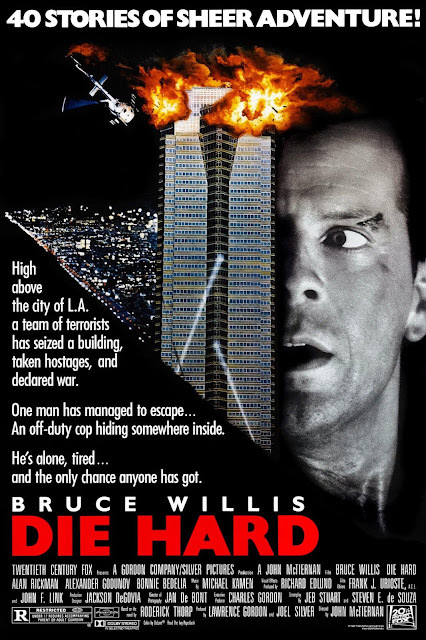 McClane has arrived in Los Angeles on Christmas Eve to win back his wife, Holly (played by Bonnie Bedelia), who has moved to Los Angeles with their children, Lucy (played by Taylor Fry) & John Jr. (played by Noah Land), to work for the Nakatomi Corporation. He plans to get her back at the Nakatomi Christmas party on the 30th floor of Nakatomi Plaza. However, these plans are quickly thwarted when German terrorist leader Hans Gruber (played by Alan Rickman) & his 12 henchmen: Karl (played by Alexander Godunov); Theo (played by Clarence Gilyard); Tony (played by Andreas Wisniewski); Franco (played by Bruno Doyon); Alexander (played by Joey Plewa); Marco (played by Lorenzo Caccialanza); Kristoff (played by Gerard Bonn); Eddie (played by Dennis Hayden); Uli (played by Al Leong); Heinrich (played by Gary Roberts); Fritz (played by Hans Buhringer); & James (played by Wilhelm von Homburg) come for $640 million in bearer bonds, taking the partygoers hostage. Their terrorist acts are merely a distraction from the heist. The only people in the building who are not held hostage are McClane & his young limo driver Argyle (played by De'voreaux White), who is trapped in the garage, oblivious to what is happening. With the help of Sgt. Al Powell (played by Reginald VelJohnson), McClane tries to fight off all 13 terrorists. The terrorists & many of the hostages doubt his ability to fight them off. But they've never met anyone like John McClane. The cast is amazing. Bruce Willis was born to play this role. He has the perfect amount of charisma & coolness for the role. Alan Rickman, in his first role, is devilishly menacing. And Reginald VelJohnson is terrific in his small role. John McTiernan's direction is excellent. McTiernan delivers on the tension, but never quits making this an absolutely fun ride. The screenplay by Jeb Stuart & Steven E. de Souza is brilliant. The plot is thoroughly intriguing, the characters are fleshed-out, & the dialogue is perfect. The editing by Frank J. Urioste & John F. Link is superb. The film is very fast-paced, making the runtime feel like a breeze. The sound design is impeccable. From the continuous gunshots to the various explosions, the sounds are loud & in-your-face. And the visual effects are stunning. The effects, especially the explosions, are very well-done, feeling completely timeless. This is one of my new favorite films. It is wildly fun, gleefully violent, & incredibly iconic. Yippie-ki-yay, indeed. Die Hard was seen by me at the MJR Marketplace Digital Cinema 20 in Sterling Heights, MI on Wednesday, January 2, 2019. It is on Ultra HD Blu-ray, Blu-ray, DVD & Digital HD. Its runtime is 132 minutes, & it is rated R.
Nice review! Die Hard is one of the best action movies. Everything works so well from the cast to the direction and action scenes.